Summer seems to have arrived with its usual vengeance and I am always on the lookout for easy recipes that require as little cooking as possible and can be eaten cold, or at room temp. I am also always looking for ways to use those ingredients that I buy for a specific recipe and for which I have no other use. Bulgur is one of those ingredients. I buy it to make Imjadara, and then the cracked wheat sits in a jar on my pantry shelf until enough time has passed for me to make it again. I would look at it every now and then, and think about figuring out something else to make with it, but my old friends rice, pasta, couscous and polenta were always there as well, and I knew what to do with them. But I had some blanched asparagus and wilted dandelion greens in the refrigerator and they were getting a little long in the tooth. I had defrosted some pork chops and was in need of a side dish. I wanted to use the greens and the asparagus together and neither of them needed to be cooked. I wandered over to the pantry shelf and looked at the rice and grains. When my eyes fell once again on the bulgur, I almost kept on going. 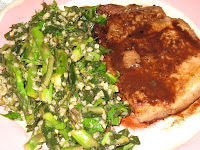 I don't know what made me start thinking about tabbouleh, and how maybe I could kinda sorta use the same technique and ingredients, but add the asparagus and greens? I had lemon and parsley on hand, and that's really all you need for tabbouleh. So I pulled out the Tabbouleh recipe I had taken from the package of the Ziyad brand bulgur I buy, and used it as my frame of reference. The main thing I like about this recipe is that you don't cook the bulgur. You just mix it with all of the ingredients and it absorbs the liquids and gets soft enough to eat. The grains are more sturdy this way - they hold their shape and texture and don't get as soggy as they do when you cook them. I only had a little bit of parsley and I wasn't sure if it would be enough, but it was. It takes a surprisingly small amount of parsley to provide that fresh-herbed kick to the salad. I also only had about three-fourths of a lemon, but that was enough acid to brighten up the salad. And the asparagus and dandelion greens complemented each other perfectly, each contributing their own subtle bitterness that was highlighted by the pungent parsley, lemon and bulgur salad. I didn't have any tomatoes or cucumbers on hand; I had just used them all up on my first batch of gazpacho. Ever the improviser, I simply added some of the gazpacho to my salad and I think it actually worked better that way - it imparted all of the flavor while leaving the asparagus to shine in the forefront while the greens smoothly enhanced the background. It turned out so well that I realized I was onto something. 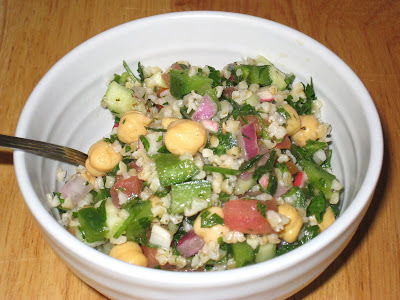 The next time I went to the grocery store I made sure to get lemons, parsley, tomatoes and cucumbers, to get even more of a tabbouleh-style base for the dish, and in the weeks since that first experiment I have made many variations. They have all been successful. The culminating point for me was when I was trying to figure out how to get some protein in there, so it could be a meal unto itself. I almost smacked myself on the head when I realized that chickpeas would be perfect. Combined with the bulgur, they make a complete protein and add a nutty taste and texture that blended so harmoniously with the rest of the ingredients. And they certainly matched the theme! The true beauty of this salad is its versatility. Outside of the bulgur, parsley, lemon juice and olive oil, you can pretty much throw in anything that you have in your refrigerator. I had a green bell pepper and some radishes that were not on any other agenda when I made the salad in the photo up on top so I threw those in. There's no limit to where this can go. Rinse bulgur under cold water and drain. Place in a large mixing bowl with the vegetables. Add lemon juice and oil and stir to mix. Season to taste with salt and pepper. Cover and refrigerate for at least two hours, until the bulgur has absorbed the liquid and is tender.